Every bride wants their wedding to be perfect, from the perfect dress to the perfect flowers to the perfect wedding rings. If you have been looking yet haven’t found the perfect wedding ring, consider working with a Master Jeweler at Allen’s Jewelers to create exactly what you are looking for. Learn what you need to know for a custom wedding ring design. While the Custom Design Process is fun and easy – it does take some preparation and time. 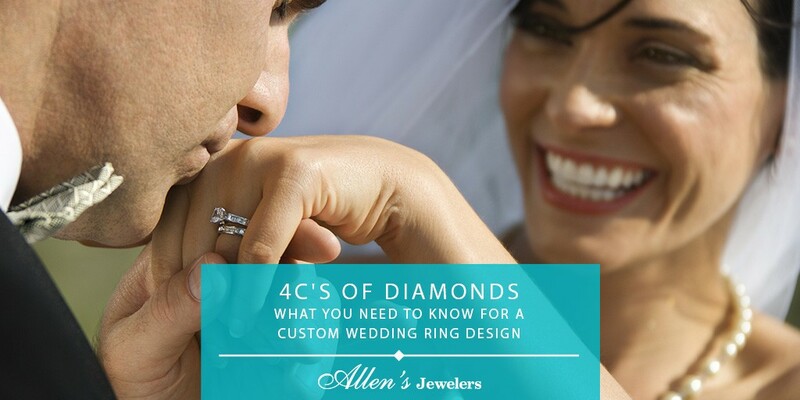 ■ Learn the 4C’s: If you are purchasing a diamond, you will want to learn the 4C’s. They classify the value and the look of diamonds. Finding your perfect diamond is determined by the combination of Cut, Color, Clarity, and Carat Weight. the 4C’s They classify the value and the look of diamonds. □ Cut– The term “cut” has two references: One is the diamond’s shape, the other is the diamond’s quality which is determined by its proportions, symmetry and polish. The most popular diamond cut shape is the round brilliant. Other cut shapes including princess, marquise, pear, heart, oval, emerald, radiant, cushion and Asscher are considered fancy cut. □ Color– Choosing the right color for your diamond is based on personal preference. It’s important to remember that you are generally searching for a stone with little to no color. □ Clarity– Clarity is a measure of the tiny imperfections found in most every diamond. A flawless diamond with little to no imperfections is often desired due to its rarity, but they are also the most costly. Therefore, it is important to keep in mind that it is very common for diamonds to be formed with slight imperfections. □ Carat Weight– Carat weight is the easiest to understand of the 4Cs. A diamond’s weight is measured in carats. The carat is subdivided into 100 equal parts called ‘points.’ One point equals .01 carat or 1/100 carat. A one carat diamond equals 100 points. 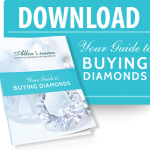 Download your Diamond Buyer’s Guide to learn more about choosing the perfect diamond. ■ Give yourself enough time: Even if you already have your stone or a family heirloom you would like to update, give the process 4 to 6 weeks. ■ Decide on a budget: Everybody has a budget they want to stay within. 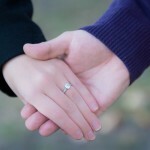 Letting the Master Jeweler know your budget will help him create the custom wedding ring you are dreaming of. ■ Choose a metal: Consider the metal you want, such as yellow gold, white gold, platinum, or one of the alternative metals. Some metals are stronger than others. 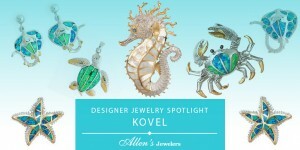 Be sure to ask our Master Jeweler about metal selection if you are unsure. ■ Style and Design: Are you more traditional or modern? Intricate or Simple? Take some time to review a variety of designs and styles to determine your preferences. Want to learn more? WATCH this interview with Dennis Marshall, Master Jeweler & Owner of Allen’s Jewelers, on Custom Wedding Ring Design.